FMDVR60A FORGE MOTORSPORT FIT RCZ 156 THP DUMP VALVE FOR RCZ 1.6 TURBO ENGINES. FMDVR60A FIT FORGE MOTORSPORT Peugeot RCZ 156 THP DUMP VALVE FOR RCZ 1.6 TURBO ENGINES. Designed specifically for the BMW/Peugeot N18 engines, (Cooper S 2011 onwards, JCW Cooper S 2013 onwards, R58 Coupe 2012 onwards, Peugeot 208 GTi late 2012 onwards, RCZ THP 156 & 200 2011 on). This product is either recommended where the boost pressure has been increased by an ECU software upgrade, for those wanting a loud blow off sound, or simply as a solution to the many failures that have occurred. The most common complaint on the OEM solenoid valve is a split diaphragm preventing the valve from opening fully, or not at all. This doesn't always result in a check engine light as the valve can still be blown open by the boost pressure. We have seen many valves with this problem (see image above). The other problem is that diaphragm retaining ring is made from very thin plastic that goes brittle with heat cycles and oil contamination, and eventually fails. This prevents the diaphragm from sealing with the same problems as mentioned above. This particular failure also results in the valve falling apart upon removal from the turbo, though in extreme cases bits of plastic can enter the turbo and destroy it. Our alternative is a fully engineered solution offering both significantly improved reliability. Our valve is piston based, with no diaphragm to fail, and of all aluminium construction, it replaces the original unit with a pressure/vacuum operated piston valve that still also retains the desirable OEM ECU control over valve actuation. The valve has been proved on the VAG scene for many years. The spring is interchangeable for different levels of boost, and the solenoid is plug and play with the wiring harness which is included. Recirc Valve N18 Engines Cooper S 2011 On, JCW Cooper S 2013 onwards. Blow Off Adaptor Plate For 2007/8 Cooper S Turbo only. Blow Off Valve N18 Engines Cooper S 2011 On, JCW Cooper S 2013 onwards. In The Box: 1 x FMDVR60A Valve 1 x Wiring Harness 1 x Solenoid, Bracket, and Screws 1 x 2000mm Length of 4mm Vac Hose 1 x Aluminium Spacer 1 x M6 x 30 Hex Head Bolt 1 x M6 Penny Washer 1 x M6 Nyloc Nut 1 x Uprated Red Spring 10 x Cable Ties 1 x 5mm T Piece 1 x Forge USB Instructions 1 x Forge Keyring and Sticker. This product is available in machined alloy finish only. Please advise choice when purchasing. GET THE CORRECT PART FIRST TIME. PLEASE MAKE SURE YOU CHECK THE NOTES SECTION TO THE LEFT OF COMPATIBILITY TABLE. IF IN ANY DOUBT PLEASE ADVISE A REG NO OR ASK SO YOU GET THE CORRECT PART FIRST TIME. Please contact Customer Services if you have any questions. We pride ourselves on a quality service and we are happy to address any concerns. The item "FMDVR60A FORGE MOTORSPORT FIT RCZ 156 THP DUMP VALVE FOR RCZ 1.6 TURBO ENGINES" is in sale since Wednesday, March 22, 2017. 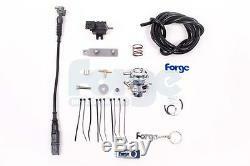 This item is in the category "Vehicle Parts & Accessories\Car Tuning & Styling\Racing Equipment & Accessories". The seller is "mjd128" and is located in Leatherhead. This item can be shipped worldwide.